After I finished the Richmond Marathon, I instantly had a sense of accomplishment. I felt so proud and so excited about what I’d just done. However, as most runners know, soon after you cross that finish line you begin thinking about what’s next. The day I ran my marathon, I swore I’d be one and done. And then I woke up the next morning thinking that I wanted to do it again (and run better and smarter). However, that may not be the case for you. I know I spent so much time thinking about the race, that I didn’t focus much on what would come after — how long I’d rest from running, what exercises I would do, etc. Pack your bag check gear carefully. This is SO important! Think about what you might want after being on your feet for hours and hours. For me, I packed a warm shirt, flip flops, and face wipes. I wish I’d packed comfy socks and my cozy moccasin shoes instead. My feet hurt so much that the flip flops didn’t do the trick. Next time, I’ll be prepared! Get back on the horse (or don’t). I knew the day after my marathon that I wanted to do it again. About a week after my race, I committed to the Potomac River Running Marathon Training Program that starts Saturday. It was important to me to jump on it once I knew I’d be running another race. If you are feeling like you want to race again, go ahead and sign up. But don’t feel pressured to! While it’s important to stay active and healthy, you don’t have to be on a constant schedule of working towards a race. What did you do after your last big race? Anything you’d change? I ended up resting for almost 2 weeks which was WAY too long. I had a hard time getting my running legs back and I’m STILL struggling! Will definitely do another marathon, but I will save it for the fall. Going to work on getting stronger so I can have fewer injuries next time. Going to focus on a speedy half marathon for the spring! Congrats!! I’ll be running my first half in Feb. I’m doing the glass slipper challenge at Disney. ( 5K on Friday, 10K on Saturday, and half on Sunday, and I have been wondering how long I should wait before signing up for another race. I just did 13 miles yesterday and my legs are killing me today. I can’t imagine how i’m going to feel after that race weekend. Congrats again on your Marathon! Lacey@fairytalesandfitness recently posted…Cadence, Pureflow, Ghosts, and Lunarfly’s, O my! Mar @ Mar on the Run! recently posted…10 Tips for New Bloggers! After my first marathon I didn’t do much for a while. Our training team had us meet the following weekend for a 3 mile walk. Once I’d been running for a few years, I went for a two mile walk/jog the very next day after my first 50k. No big deal. It’s always so fun to see people who say “I’m just going to run a marathon this one time and never again”…and before you know it you’re seeing them start lines all over the place! Makes my heart sing! I know — I can’t believe I’m doing it again 🙂 I kinda feel like just having the knowledge of how much it might hurt is beneficial. Now I know! I made the mistake of not running for too long after. I have still been stuck in the no motivation rut. I have a plan though. I have been walking a lot more this week and plan a run over the weekend. I just wanted to drop you a line and let you know that I love your blog! I know I’ve said this before, but you’re inspiring! I wished I felt the same after running my first marathon in Singapore. I hope one day I gain enough motivation to run again! 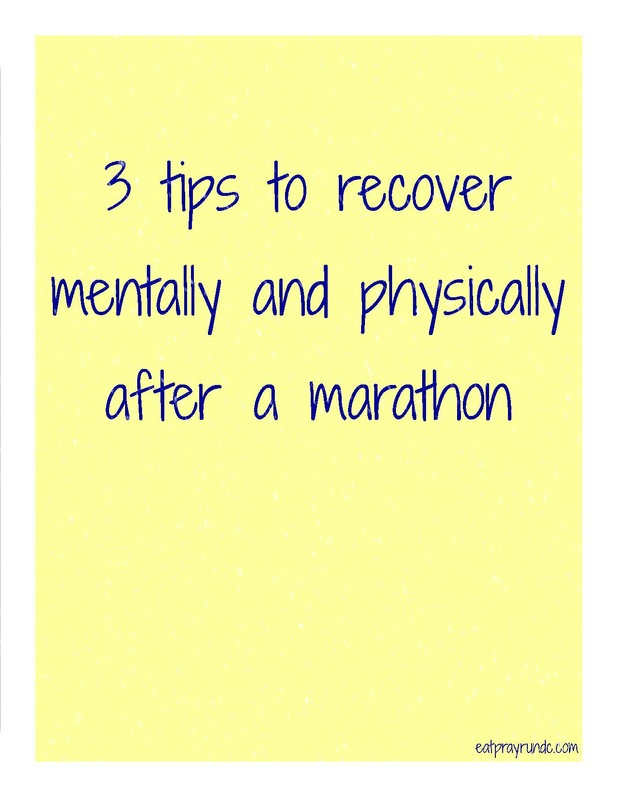 Running a marathon is a huge achievement in my opinion!! I have only run one, and I don’t know if I will ever run another, but this is great advice. I could barely walk after mine…my legs felt like chopping blocks!